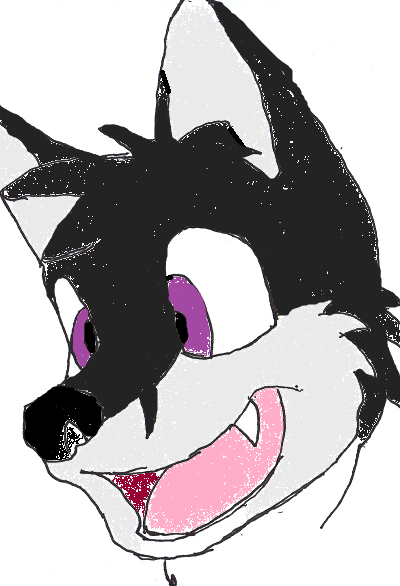 Apollo is a black and white Husky of average height, his build lithe and slim, like most other pets. Black fur covers his back, shoulders, back of the ears and head, the sides of his body, and the outside-facing parts of his legs and tail. White fur covers his belly, lower arms and paws, inner parts of the legs and tail, and most of the face. There is a black “mask” over his eyes and a bridge to his nose. His eyes are purple, as is his collar. On occasion, mainly in the wintertime, he wears a yellow scarf and/or yellow earmuffs. His “tag” is a crescent moon. The main way to identify Apollo is his bad stutter, which mainly triggers when excited. Apollo has a very eccentric, enthusiastic and energetic personality. He talks quickly when he’s excited and softly when saddened. He very rarely gets angry, and is an over-thinker of perspective and logic. He plays the guitar and likes to write stories, often involving his strange infatuation with pirates. He collects rocks, which are displayed on shelves in the backyard shed he decorated as his “house”, filled with many of his eccentric fancies, which he finds completely normal. He refers occasionally to family he was “adopted” to as a Pup, living with his two German Shepherd brothers. He lives as an only pet now in a shed in his owners backyard, furnished with makeshift things he apparently crafted in his spare time..
Oh, this is me. Um, ok.
1) This isn't your "fursona" is it? 2) You've never posted anywhere else on the forums, so I don't have anything to analyze you with. Oh, the introductory guidelines in the forum of your community suggested that I create my character sheet and submit it to the Main OOC forum, so I did. And you could call this my "fursona", however I sculpted it into more of a character for Roleplay. And thanks, by the way. Oh my, is there some sort of overview of the community's ongoing story, or something like that? I feel a bit foolish for not thinking of that. See, as I'm new to the forum, I assumed a character made up to represent myself in one way or another might be a better idea, but if it isn't, I apologize. Perhaps a different community might be an easier solution? Um... you mean "neighborhood" instead of "community", and they're all kinda like that. People have played as their Fursonas before, but as I said, that can get a bit personal because things don't always go well for characters. I've seen characters have TERRIBLE days, 'cause that's just how good writing goes. Also, there's a temptation to just give your character things which don't make plot sense but make them happy. That's called gratification, and it can annoy people. Okay, I see where you're coming from, and excuse me, neighborhoods*, I'll look into the one you suggested. Though, of course roleplay is roleplay, and if something bad is to happen to a character, figuratively mine, that's all part of the story, and I'm all for some conflict if it comes to it! Hey there, I just wanted to give everyone a heads up, tomorrow I will be heading back to Job Corps, from holiday leave, so that means I will not be able to get on the forums until Winter Break, I may be able to get on during the weekends, but I am very unsure of those being stable, so I will have to go on a hiatus until Winter Break. I have talked to Brent and Leaf and both will be given temporary control of my characters, as well as Raccoon, but only if he can and is willing to. 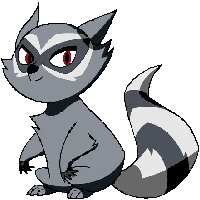 I thank you Leaf and Brent, Raccoon as well if he accepts, and I apologise to everyone in the RP section for leaving on such short notice, I had fun this week, and when I get back I will make sure to have much more! -Name: Carter “Lucky” Abbot. The name “Lucky” is his K-9 unit nickname. Contrary to popular belief, he is far from lucky. -Age: Approximately 25 in dog years. His birthday is July 12th. -Weight/body build: Stocky thick build thanks to sled dog genetics. Prone to putting on weight and tries to keep it off as hard as he can, though it still creeps on occasionally. -Cynical and enjoys self depreciating humor, especially when it comes to his disabilities. -Intuitive thinker and is fairly book smart. -His most important possession is his dad's lucky dog tag, to which he attributes what little luck he has in any situation. Has almost religious devotion to the trinket and is incredibly superstitious about his luck. Lucky was born in Juneau Alaska and moved with his owner's to their hometown in Dupont, Louisiana. Unlike a good amount of dogs he grew up with most of his extended family. His owners kept his parents and a few dogs from each of their litters. His mother is a Shetland Sheepdog from Georgia named Mary Abbot and his father is a native born Alaskan Malamute Husky named Keitl “Kei” Abbot. He is the eldest of his siblings, of which he has four brothers and two younger sisters. Among his friends he is infamous for his incredibly bad luck, if something can go wrong it usually does when he is involved. For example, when he was younger he permanently damaged his knee in a bizarre trampoline incident, he doesn't speak of it beyond that. He joined K-9 when he was fairly young, had to work past his bad knee at the academy and developed extreme perseverance as a result. On the downside he will push himself until he can't push any more. Within his local K-9 unit he is a qualified “Sniffer” and “urban patrol dog." Sniffers are dogs used for the ability to track a scent and Urban Patrol basically keeps an eye on criminal hot spots out on the street. -odd Habits include: paces when waiting, likes to hold things when he's stressed, chews on something when he thinks. -Walks with a slight limp due to his leg. -Always needs to be where the action is and can't get enough of social settings. -A big eater, not afraid to try any kind of food. -A classic literature buff, when push comes to shove, however, he prefers nonfiction. -Enjoys all sorts of out doors type activities, used to camp often until an incident involving a bear, a canoe, and a model airplane. Strengths: Over all a very open and friendly dog with a firm control on his temper. Physically he is quite athletic and strong. Hard to keep back when he sets his mind on something. Weaknesses: Knows no such thing as personal space, due in part to his large family, might come off as nosy and too up front when talking to some people. Quite clumsy and a bit of a walking hazard due to size and weight. Will work until he physically is incapable of doing anything. Agility: 4 "The size and bad leg kind of end up a hindrance for that whole running thing." The main color of Allison's coat is very pale grey, almost white. From the very bottom of her neck and down is brown, and her tail is long, sleek, and dark brown. Her paws are brown, except for her paws, which are white. Her hind paws are white. The area on her muzzle, cheeks, and around her eyes are brown, with a patch of black underneath her eyes. On the right side of her muzzle, it is black. Her ears are dark brown, and one of them has a chunk missing. A small patch of pink is underneath her nose. Her eyes are wide and hazel. Her collar is dark green, and the tag is the British flag. Allison was born in London, England. Her parents worked at a coffee shop in England, but it was shut down after 2 years since Allison's parents put an illegal brand of sugar in their coffee. They moved to Blue Peak Shore for a fresh new start. Her parents struggle to maintain their new jobs- selling houses - and to keep their pet, Allison, happy. Allison misses England dearly, since she had tons of friends there, and loved their coffee. Her parents gave her American coffee, and Allison immediately fell in love with it. Allison, now living in Blue Peak Shore, has forgotten all about England, since the only thing she has to worry about now is making new friends, and if her parents take away her coffee maker. Allison, despite her small size, acts very big and large. She is brave and loud-spoken, and isn't afraid to speak her mind. When you first meet her, she may seem pushy and annoying, but when you get to know her she is very sweet and caring. Allison cares for all, and will jump in to save her friends. -She is from London, England and has a strong British accent. -She has a fear of heights. -Allison loves the rain, and when it is storming she is likely to sit outside and play in the puddles and rain. -Allison has a scar on her ear from trying to reach the cookie jar when she was only a kit. The jar fell, and glass flew everywhere, including slicing off some of her ear. Allison views the scar as a sigh, and has a strong fear of glass things. -She hates mirrors and the dark. Forget GrapexPeanut. I ship GrapexRufus. Last edited by Fuzz on Sat Dec 01, 2012 6:38 am, edited 1 time in total. heh, looks like we have a candidate friend for Lucky. Welcome aboard! the first new player's character is Lucky, who Val just mentioned. Good. Now, you need to look for a neighborhood. A couple of them have been advertising openings in this thread recently, so you might get an invite to join one in a moment. In the mean time, I think you should work on that sheet a bit. The sections could use a space in between them, and you could have a bit more description in them, as well as some formatting to make everything look nice. If you want an example of a good sheet, go look at one of my character sheets: there's a link to a list of them if you click the picture in my signature. Btw...so do i just look for openings or will they come to me? Last edited by XxCyberGamerxX on Sun Dec 02, 2012 8:29 pm, edited 2 times in total. Well, now that you've posted in there, you wait for someone from there to come by and respond to your character. In the mean time, I suggest you improve that character sheet. Appearance: Copper has a long, flowing coat that has a coppery sheen to it, regular of his breed. He has cobalt blue eyes and a deep , gravelly voice. When in town, he wears an emerald green collar studded with pennies, each one reflective of one major event in his life. He always has a messenger bag with various items including grooming tools, his collar (when not in town), a locked locket, and a stone pendant in the shape of a double spiral, as well as any food or money he might have. Personality: Due to a hard past, Copper is distant, though cordial. He rarely lets on about anything involving himself or anyone else. Great at keeping secrets, horrible with people. He has very little in terms of social skills, and will sometimes wander off in the middle of a conversation if he cannot contribute to it, not realizing it is rude. He is shrewd and calculating, an observer who shows little emotionally. Other Notes: Copper is basically a wandering stray, going from town to town and only staying long enough to fulfill his needs, whether they be basic or social. He accomplishes this by camping in nearby woods or abandoned bridges/buildings and going out in his collar from a previous owner when in town, acting like a regular pet. He is skilled in tai chi and practices regularly and although he is a stray, he usually earns or scavenges what he gets, rather than stealing. He is also very cagey when it comes to his past, rarely giving any info out. Thought I'd try my hand at RPing. Any neighborhoods open for a greenhorn? Last edited by copper on Thu Dec 06, 2012 4:51 pm, edited 1 time in total. Pretty sure Richmond Acres has some more openings. He might fit in there. I think Sunset does as well. Both are good for beginners with a relaxed posting rate. Applegate is a tad broken at the moment or I'd advise there if you like playing with ghosts. I'd definitely be open to adding new players but like he said it's a bit broken and likely won't get fixed until sometime after finals. BPS is your best bet if you want a consistent posting rate richmond acres and have seem pretty active as well. Choose Sunset, then I wouldn't need to make a new character to play with you. just get my current one away from the seemingly endless and un-posted game of tag. Or Applegate, but most of the characters are in a big, kind of exlcusive group right now. BPS is fun, and Val won't let your character get stuck with nothing to do. He has like, a two NPCs for every active character. These forums need some type of rss feed or I'm not seeing it somewhere. Mostly cause I keep refreshing the page every so often. I know there's email notifications, but I get other important email too. Sigh. My apologies for my recent "Neglection" to post in the RP's I am involved with, I know I keep posting than it appears to be a week or so between posts but I am dealing with some State tests and other obligations that with all due respect more than outway an RP in priority. I will try harder to find more time to post in the RP's, and again my apologies for any holdups I may have caused. My computer died tonight, i think the powersupply blew up.. had to pull out an old win95/98 machine to get back here. It's only inappropriate if the response has no meaning other than "oh ok."
That one was loaded with meaning that was best summed up with a single emote. Don't be a mini mod, you'll ruin my Discord-like reign of chaos, lawl. Bad mod, leading your flock o sheep astray! No cookie!! Old computer was pernounced DoA by the geek squad. Over from my old HD, an I'll be back! Keep posting an don't wait up for me, I will catch up really fast. the reason I am being slower in responding is that Modem has decided to go Skynet and is now trying to get control of TV. I fear he's lobotomized already. While waiting for either Fix-It Furret or a mere mortal with some technician skills, I'm stuck with Tablet as router for limited periods of time. Why are they doing this to me?! I love tech, I am devoted of tech, I don't deserve punishment! I will be participating in a game jam this weekend with a couple other people so I may not post like I usually do. Should go back to normal by Monday. Apologies in advance.